Refractors (also known as dioptrics) are what the average person identifies with the word "telescope", a long, thin tube where light passes in a straight line from the front objective lens directly to the eyepiece at the opposite end of the tube. Lately those focal lengths have got shorter as astrophotography matures and gets cheaper with the advent of Digital SLR Cameras with better low light performance. Easy to use and reliable due to the simplicity of design. Good for distant terrestrial viewing. High contract images with no secondary mirror or diagonal obstruction. Colour correction is good in achromatic designs and excellent in apochromatic and fluorite designs. 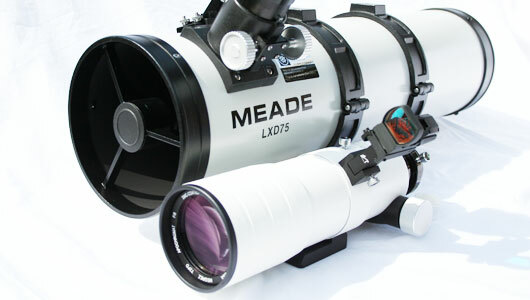 Sealed optical tube reduces imagine degrading air currents and protects optics. Objective lens is permanently mounted and aligned. More expensive per inch of aperture than Newtonians or catadioptrics. Heavier, longer and bulkier than equivalent aperture Newtonians and catadioptrics. The cost and bulk factors limit the practical useful maximum size objective to small apertures. Less suited for viewing small and faint deep sky objects such as distant galaxies and nebulae because of practical aperture limitations. Focal ratios are usually long (f/11 or slower) making photography of deep sky objects more difficult. f/4 to f/7 are preferred for this. Some Colour aberration in achromatic designs (doublet). Apochromatic Refractors are pretty much colour free, but this is reflected in the cost. In summary a small reflector is the best general purpose telescope for beginners as they are good on all types of objects and for starting astrophotography, if they are lower than f/10 focal ratio, f/5 being very fast. 90mm f/6 is an ideal portable telescope. Catadioptrics use a combination of mirrors and lenses to fold the optics and form the image. There are two popular designs: the Schmidt-Cassegrain and the Maksutov-Cassegrain. In the Schmidt-Cassegrain the light enters through a thin aspheric Schmidt correcting lens, it then strikes the spherical primary mirror which reflects the light out an opening in the rear of the instrument where the image is formed at the eyepiece. Catadioptrics are the most popular type of instrument, with the most modern design, marketed throughout the world in 3.5" and larger apertures.